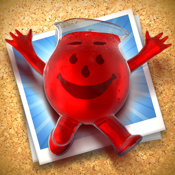 Now Kool-Aid Man can photobomb all your favorite photos! You select his pose, make him bigger, smaller, rotate him and place him in your pics for Kool-Aid flavored photobombing fun! Then share to all your favorite social networks!